Sometimes watch collecting or enthusiasm goes past the love for watches. It is about stories and heritage that has more meaning than the watch itself. Today, Fratello Watches brings you the story of RAF Squadron Leader Frank Wright Walton (Lieutenant of the Royal Victorian Order, Distinguished Flying Cross and bar) and his Omega 30T2 pilot’s watch. 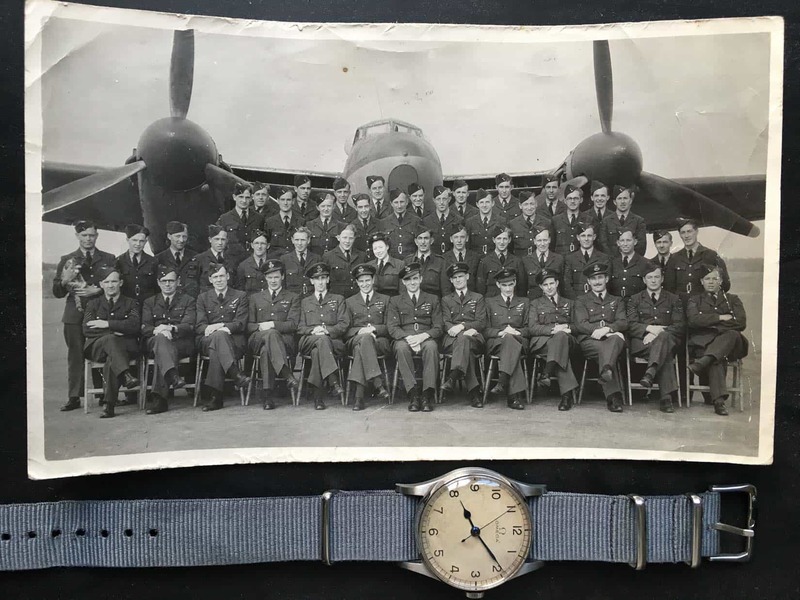 Not too long ago, I received a message from Julian after I posted a military Longines that was sent to a Londoner in the RAF Pathfinders in 1941. 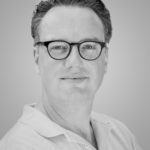 Julian told me that his grandfather was also in the Pathfinders in WWII, as a Squadron Leader of 109 Squadron and that he had inherited his RAF issued Omega 30T2 timepiece. Frank W. Walton on the left. Most pilot’s watches you’ve probably seen, have black dials. 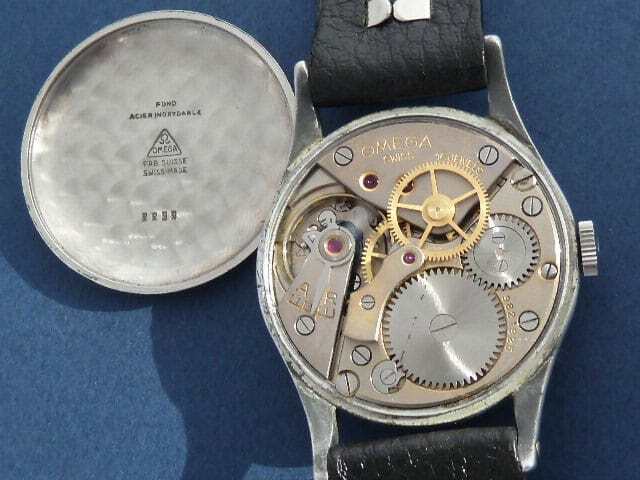 At the start of WWII however, the RAF tendered watchmakers to come up with a watch that had railroad markers, Arabic numerals, a white face for legibility (especially at night) and just 3 hands. Omega became one of the suppliers of these watches and issued their reference CK2292 watch with reliable (and still praised) 30T2 SC movement to the RAF. Pilots and navigators in (at least) bomber command, that required reliable and synchronized watches, received this Omega 30T2 SC from the RAF. It was necessary that their watches were synced before each mission (and kept time) to drop their loads at exactly the right time. This was a serious problem when performing night raids with multiple squadrons on a 7,5-hour return trip to Berlin. Frank W. Walton also received this Omega reference CK2292 watch and wore it on every single one of his 71 sorties/missions. This alone was a remarkable achievement by this RAF pilot, as the average was 3 missions before a pilot was shot down, and in addition to his DFC & bar, was awarded with his oak leaves and mentioned in dispatches. Frank’s watch never let him down; it always worked perfectly. Frank on the left and his navigator Rivett on the right. Wearing the Omega CK2292 watches. 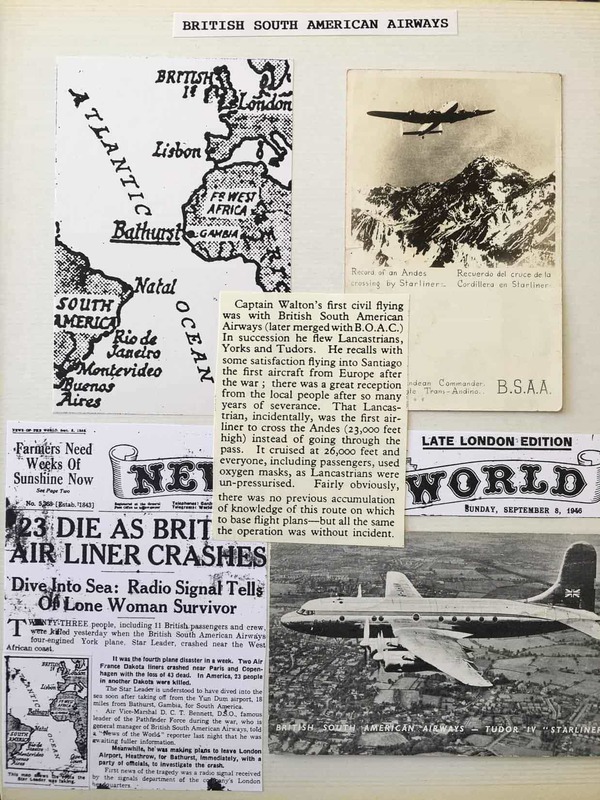 Julian (Frank’s grandson who contacted me) went through some of his grandfather’s kit and memorabilia from the RAF and after WWII, with British South American Airways (BSAA), British Overseas Airways Corporation (BOAC) and lastly British Airways (BA). Julian’s father (Geoffrey) had categorized all items meticulously and I have the pleasure of showing you some of them in this article. 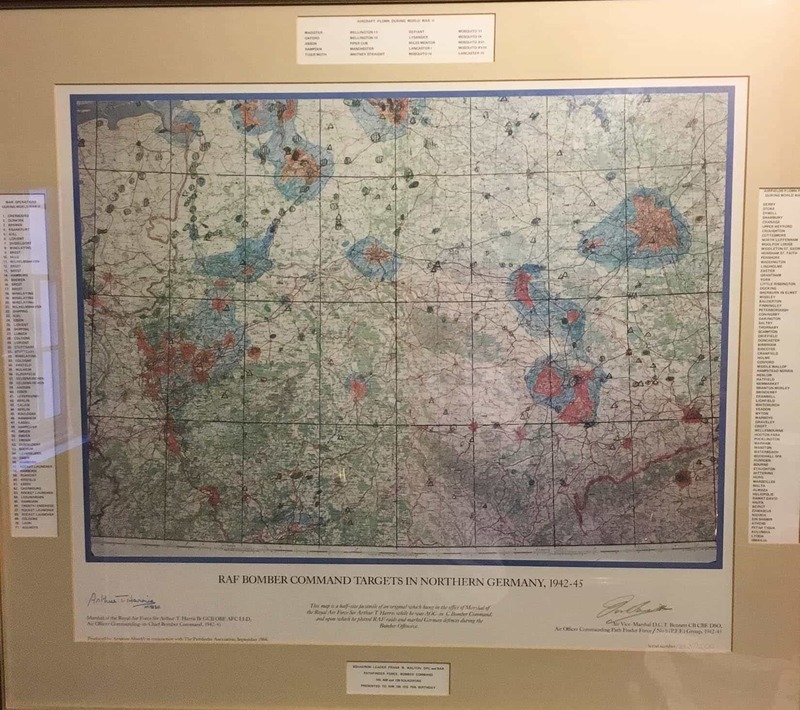 What about the framed copy of a map from Bomber Command’s HQ, signed by Marshall of the RAF Sir Arthur ‘Bomber’ T. Harris (C-in-C Bomber Command) and Air Vice Marshall D ‘Don’ C.T. Bennett (CO Path Finder Force) which shows every mission Frank flew on, every airfield he flew from and every Aircraft he flew in; always wearing his Omega CK2292 30T2 SC watch. 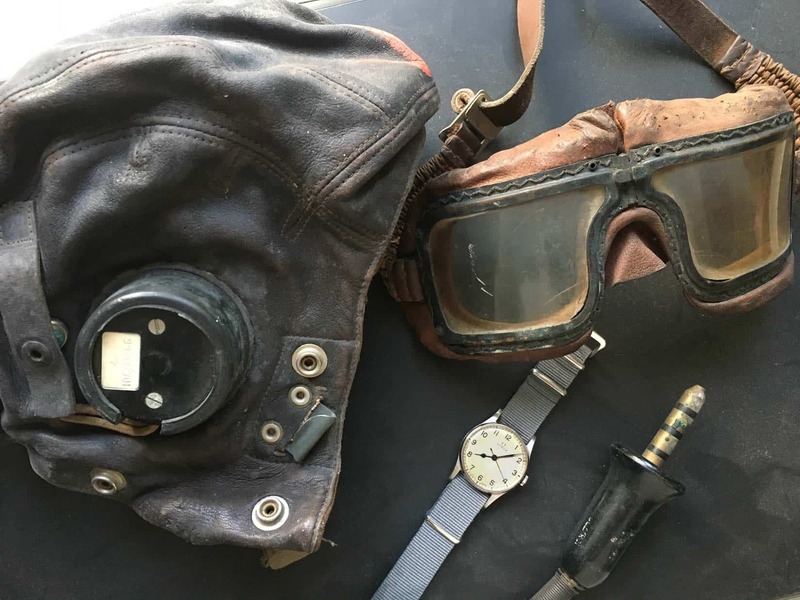 Frank’s helmet, goggles and Omega 2292 watch. Another interesting photo that Julian shares is the one that shows Frank with his RAF flight training squadron. You can see that some of the squadron members have bowler hats drawn on their heads. It was a rather morbid way to deal with the losses, as the friends who never returned from a mission received a bowler hat by Frank and his main navigator “Hitch” Hitchcock. They stopped after a while as too many were being killed. 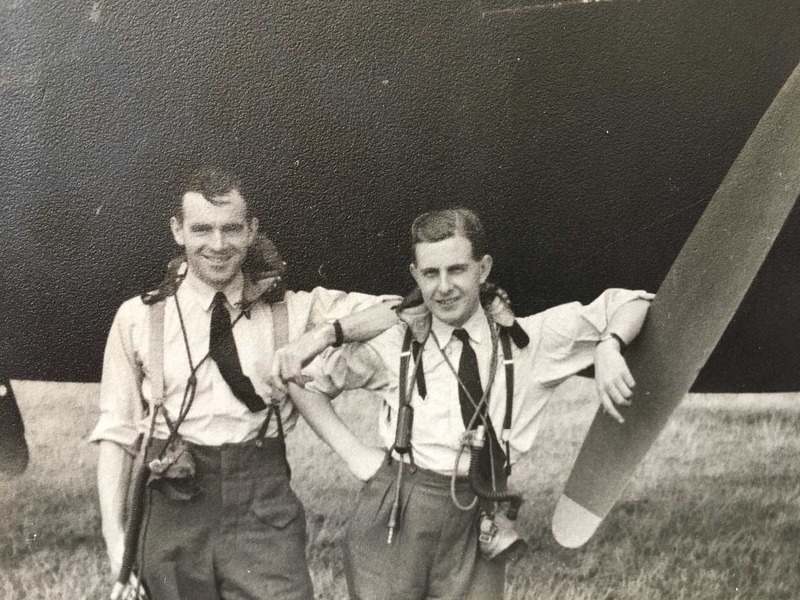 They are in the second row down in the middle (obviously without bowler hats on) – Frank with the full wings (pilot) and Hitch with the half wings (navigator). Bowler hats for those who didn’t make it. 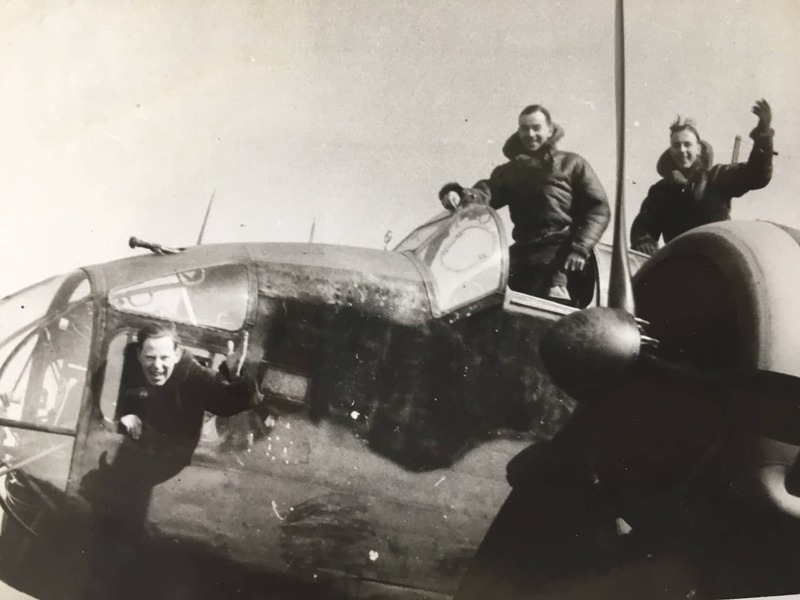 Once operational and in the first days of bombing operations the men were often thrown together on missions (“Right lads, next plane is a Lancaster. We need a pilot, navigator, bomb aimer, engineer, front gunner, middle gunner, back gunner – crew up!”). But very quickly they stuck together as a band of brothers and it was unlucky to do otherwise. Frank’s main navigators were Hitch (on his first tour of duty) and on his second tour, it was mainly Rivett – who is seen in one of the photos with Frank; both wearing their Omegas 30T2s. 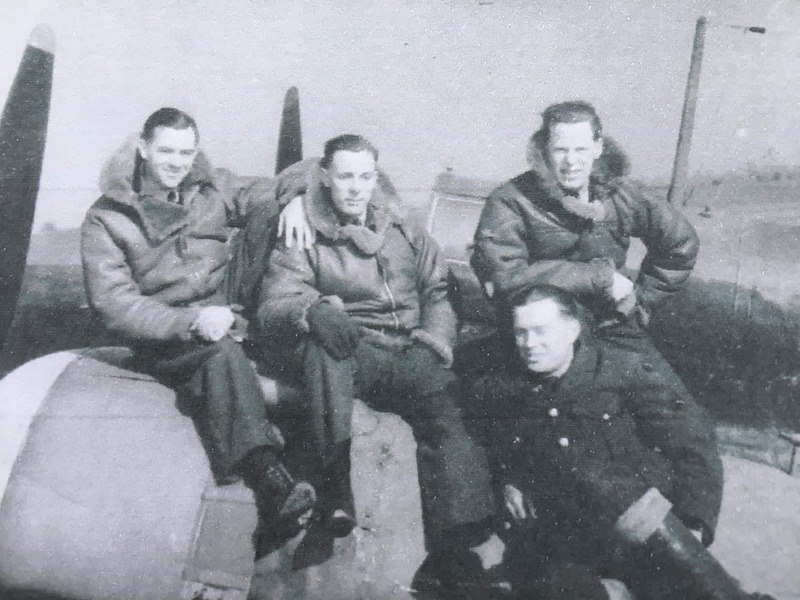 On the photo with the rest of the 109 Squadron, you can see Frank wearing his Omega. He is in the first row (below), in the centre with his legs straight and his hat at a jaunty angle. After the war, the aforementioned Air Vice Marshall D ‘Don’ C.T. Bennett formed British South American Airways (BSAA) and gathered his talented pilots from the Pathfinder force to join him. Among them, Frank W. Walton. 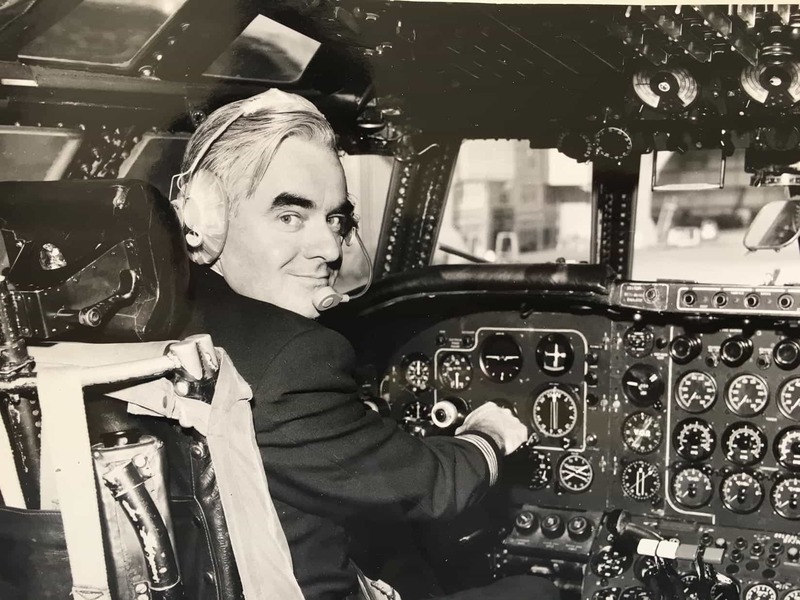 On the photo that his grandson sent us, you will see him flying the first commercial flight into Santiago after the war. That Lancastrian (a converted Lancaster bomber) was the first airliner to cross the Andes, so the crew and passengers had to use oxygen masks as the cabin was unpressurised. 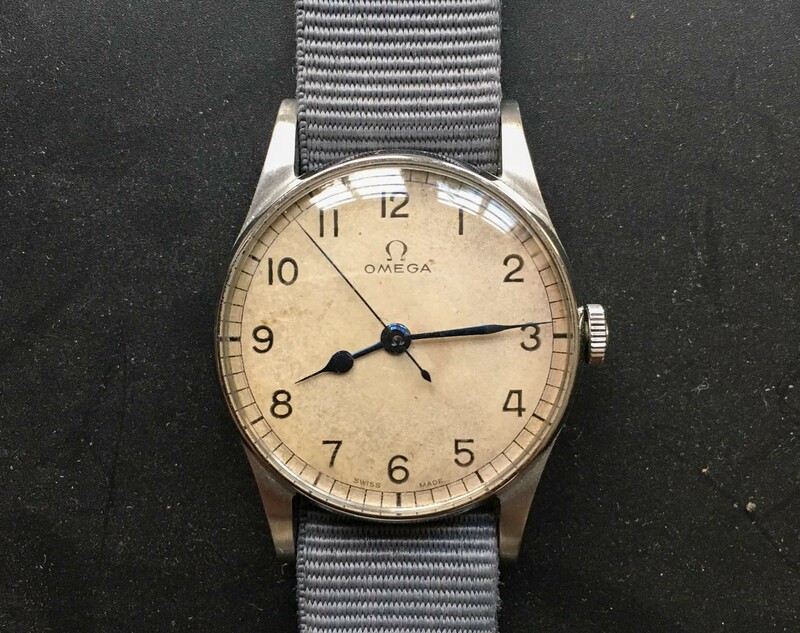 Frank kept wearing his Omega CK2292 30T2 watch on all his flights after WWII, because he felt it was the most accurate of his timepieces, but also as a good luck charm. When he wasn’t flying, he wore a gold Omega Seamaster with black dial (pictured), but as soon as he had to leave for a flight, he would swap that dress watch for the watch he received from the RAF. He actually received this gold Seamaster from fellow pathfinder Len Gatrill, who gave it as a sign of their friendship. Frank’s grandson Julian, (who emailed me), writes that his grandfather was a charming and charismatic man. 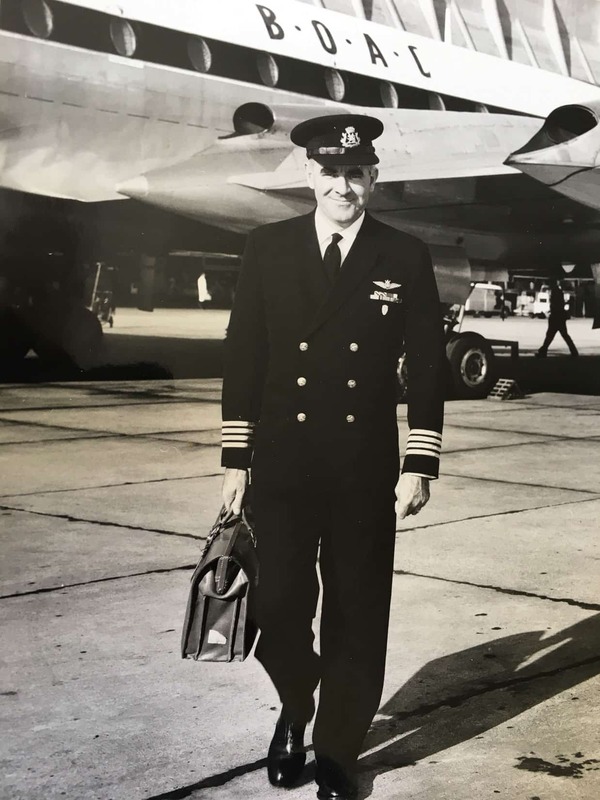 The photos show this as well, both posing with his friends in WWII and very ‘Sean Connery in Diamonds Are Forever’ in the picture below during his time with BOAC (shown holding a briefcase). 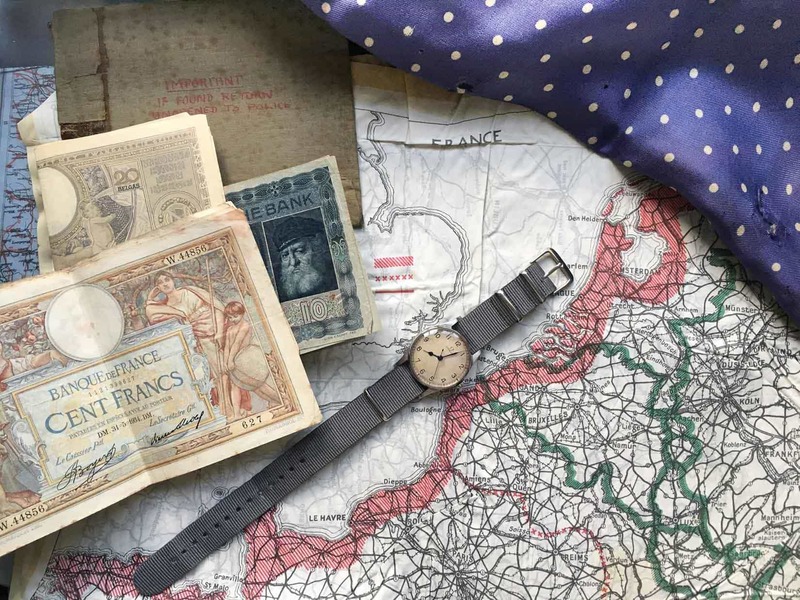 Besides his grandfather’s Omega CK2292 – which still keeps perfect time and gets some wear from time to time – Julian also has his grandfather’s helmet, goggles, uniform and bomber jacket (not in the photos), silk hanky escape map, escape money (note the comment on the envelope, that it must be returned unopened to the police) in French, Belgian and Dutch currency and his blue polka dot flying scarf. Squadron Leader Frank W. Walton praised his pilot’s watch for its reliability and precision. So much so, that he kept wearing it when he needed to depend on it. He ended his career as Director of the Queen’s Flight and a member of the Executive Committee of British Airways. 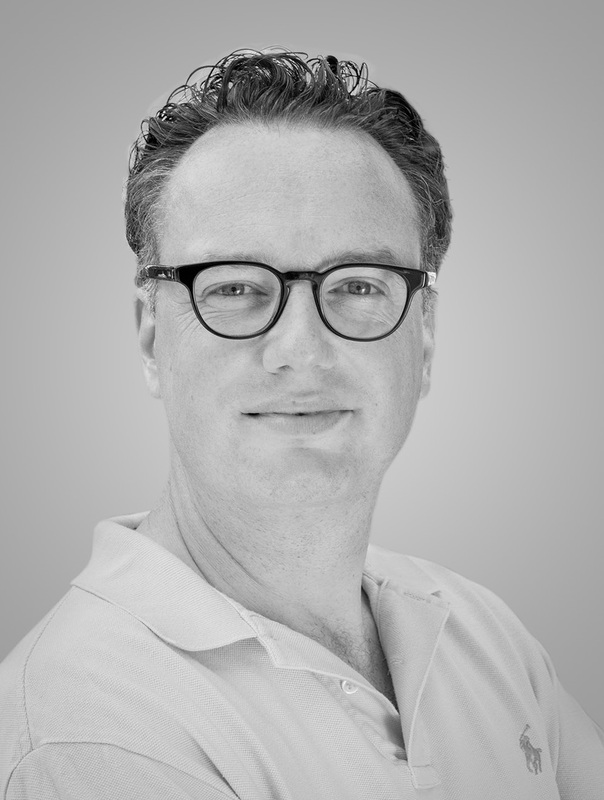 Julian remembers sitting on his grandfather’s lap listening to the therapeutic ticking of his Omega CK2292 RAF watch. Luckily, the watch is his now and every time he looks at it and hears the ticking of the 30T2 SC movement, it reminds him of his grandfather. 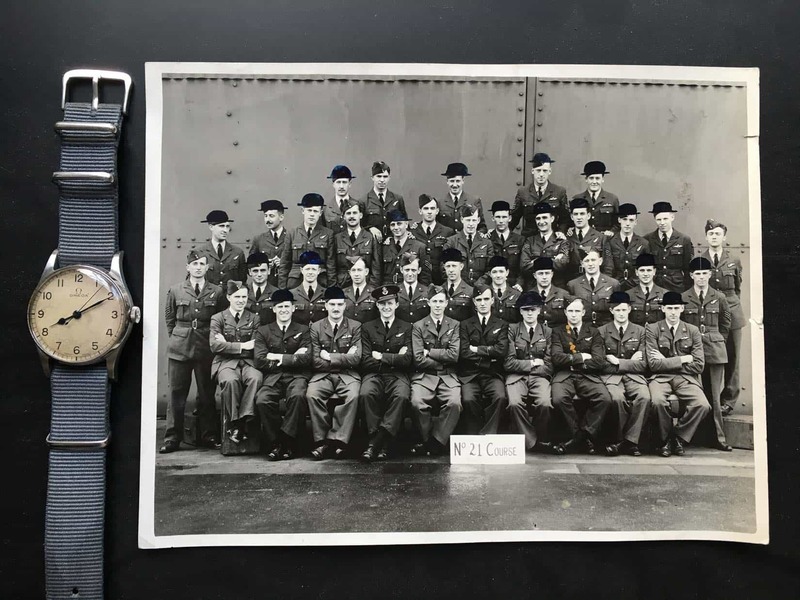 The Omega CK2292 watches were delivered to the RAF from 1940 onwards and according to “A concise guide to military timepieces” by Z.M. Wesolowski, the early ones had a nickel case only to be replaced not much later with soft alloy cases. The 30T2 movement is a legendary movement that was in production from 1939 until 1963 in several iterations (30T2 was later known as calibre 26x and 28x movements as well). The 30T2 movement used in these CK2292 military watches had a centre seconds hand, also known as the 30T2 SC version. This 16 jewel movement has a power reserve of 44 hours and ticks at 18.000 VPH. The caliber 30T2 SC is not chronometer certified, but it did receive special regulation requested by the British government. Caliber 30T2 SC movement. Image via Poshtime. Omega CK2292 watches had all satin brushed case, a non-signed crown and measure approx. 33mm in diameter. A very small watch to today’s standards you could say. However, a watch with this history and appearance can easily be worn no matter what wrist size you have. It is a perfect conversation maker, especially when it belonged to one of your relatives. 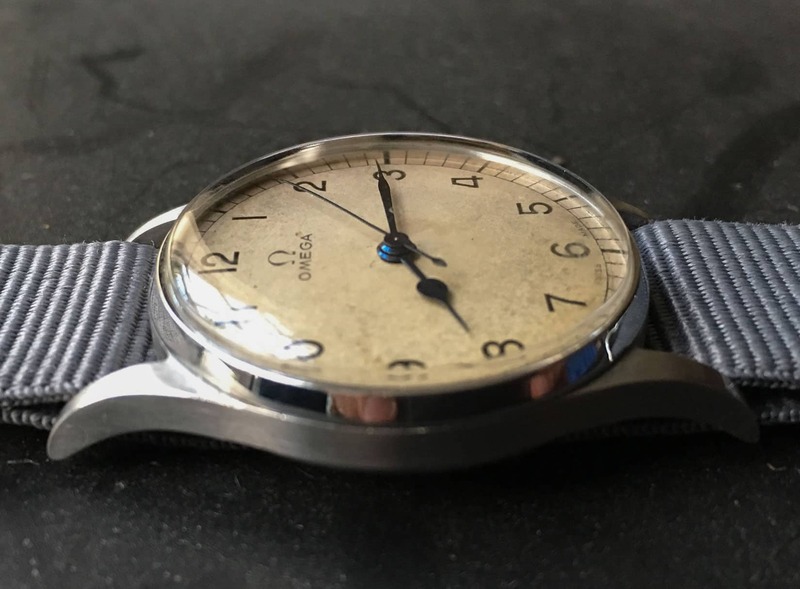 According to some unverified sources, Omega supplied 110.000 watches to the British forces, but only 3000 pieces of this Omega CK2292 watch. The simple design, white dial and classic blued ‘pear’ shaped hands do not immediately make you think of a military watch, but it really was. A lot of these watches have been engraved on the caseback. Either marked “HS8” for the Royal Navy and Fleet Air Arm or 6B/159s for RAF. The 2292 was also available with a soft alloy case (aluminium, copper, magnesium and manganese) and was referred to as UK2292. You can still find these watches in good condition on eBay and other sources between 1000 and 2000 Euro, depending on the technical and aesthetic condition. 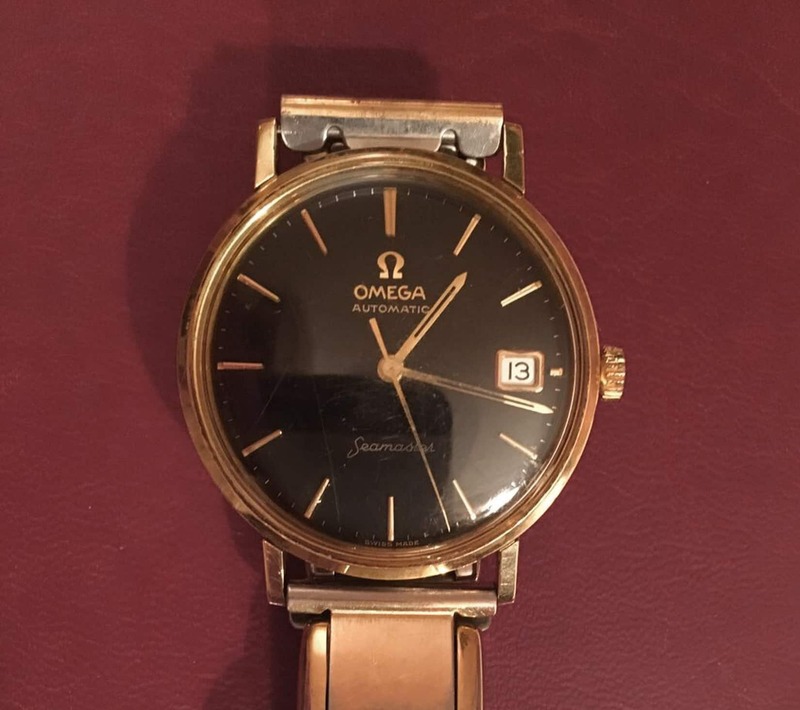 Some watches are being offered with the Extract of the Archives from Omega, stating that it was ‘produced with special dial and hands for the British Government’. If not, you can request such an extract yourself on the official Omega website (in the USA, you need to do a request via an official Omega Boutique). What you can’t buy though, is an incredible story like the one about Frank W. Walton who wore his CK2292 on his missions during WWII and his pioneering aviation adventures after. Frank Walton pictured in the center. Frank W. Walton passed away on December 14 in 1997, age 80. A big thank you to Julian ( @mrjulestrue on Instagram) for sharing his story with us. The Orde Sketch portrait was commissioned by Bomber Command to record their “Heroes” for Morale. Other notable Pilots that Orde drew included Lord Dundas (a close friend of Frank’s and the last person to see him alive) and Douglas Bader.